Curious Cbus: Why Doesn't Columbus Have Pigeons? When you visit large cities like San Francisco, Chicago or New York, pigeons are a common sight. You’ll find them nesting on window sills, walking on sidewalks and congregating in public parks. If you don’t see them in person, the evidence of pigeons will be obvious in the droppings they leave behind, covering once-dignified statues and monuments. But here in Columbus, you’re less likely to have pigeons scurrying under your feet or flapping out of your way. At least, that’s the popular perception. Adam Uhas wrote into our Curious Cbus project to ask, “Why doesn’t Columbus have a pigeon population like other cities?” The question overwhelmingly won our latest voting round. Why Do Pigeons Thrive In Cities? In my search for an answer, the first stop was the office of Christopher Tonra, an ornithology professor at The Ohio State University. At first, the question about pigeons in Columbus puzzled him. “I tend to notice birds wherever I am when I'm outside, and I frequently see pigeons," Tonra said. Tonra said there are of two flocks he regularly sees near campus. Though pigeons are often thought of as bland brown or grey birds, some have a vivid iridescent collar of feathers around their neck. Tonra explained that pigeons, as they're commonly referred, are actually a species known as the rock pigeon. The pigeons we see are feral birds, the descendants of domesticated pigeons once kept and bred by humans for their homing abilities as messengers or recreationally for pigeon racing. That’s one reason why pigeons today are commonly found in areas populated by humans. Another reason why pigeons are well-adapted to urban life is because of the natural habitat of their undomesticated cousins. Tonra said that rock pigeons naturally nest on rocky cliffs. “So if you go somewhere like the Cliffs of Moher in Ireland, you can see native pigeons nesting on those cliffs sides,” Tonra said. Urban environments provide similar crevasses where pigeons can build their nests. “Our bridges or buildings provide good habitat for them,” he said. 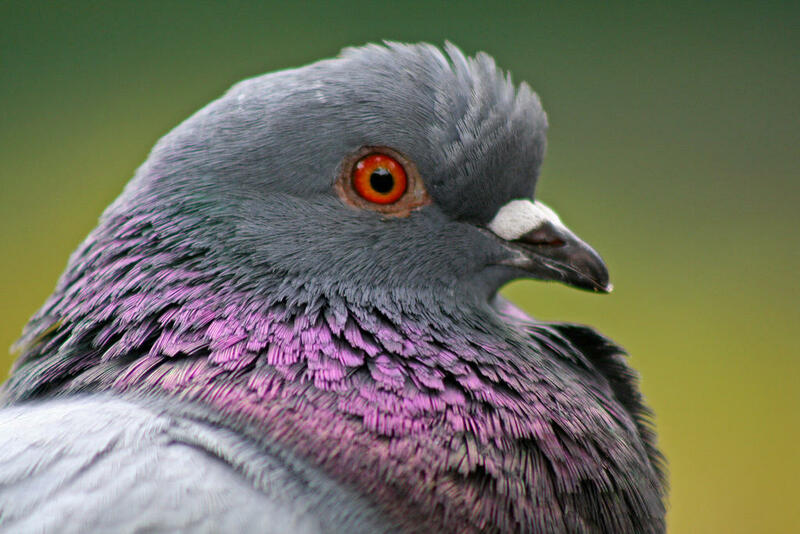 The US Army used pigeons to send messages during both World Wars. (Left) A pigeon with a US Army identification number printed on its wing. (Right) Pigeons in baskets being loaded onto a train car in Dunkerque, France during WWI. Humans also provide food for pigeons, either intentionally with bird seed or unintentionally with our waste. “They can do pretty well eating on trash or feed that's put out,” Tonra said. Also, because of a particular biological adaptation, pigeons don’t have to be picky about what they eat. Because of all of these traits, pigeons spread across the country and made homes in nearly every place where a human population resides. According to data from the Cornell Lab of Ornithology, pigeons inhabit nearly every region in the United States. 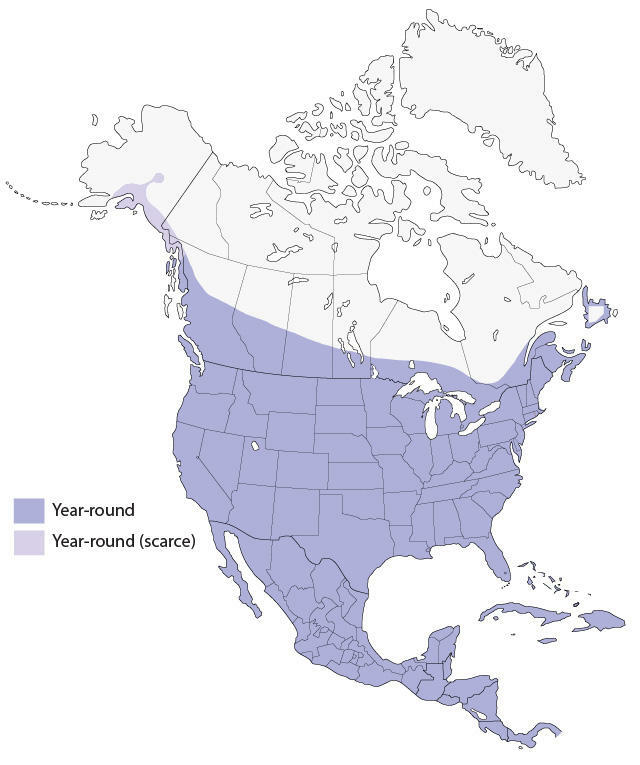 Map depicting the distribution of rock pigeons across North America. But it's hard to get a definite answer to the question of why there seem to be so many more pigeons in some cities compared to others. I bounced a couple theories off Tonra: Maybe Ohio has more predatory birds that keep the pigeon population in check? Tonra said that was unlikely. Several birds of prey are known to eat pigeons - including peregrine falcons, which are native to Ohio - but those birds can also be found in big cities. Perhaps Columbus didn’t historically have as many hobbyists who raised pigeons? Since pigeons are not migratory and don’t tend to travel very far from where they are born, that might be a factor. Tonra said that a city with a long, robust history of pigeon breeding might tend to have more birds, but that it's hard to know for sure. Besides, pigeons live across North America, and Ohio has active pigeon clubs even today. Is it that cities with bigger buildings provide more nesting areas for pigeons? Columbus, after all, has fewer skyscraper than New York or Chicago - and every window ledge is another possible nook for a pigeon to call home. Columbus is also more spread out compared to comparably-populated urban areas. 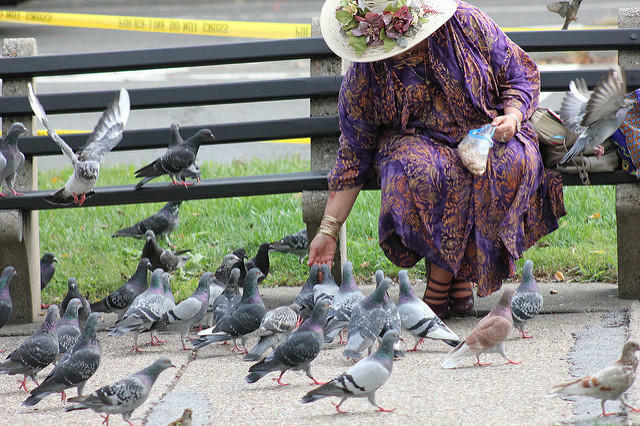 Woman feeds pigeons in DuPont Circle, Washington D.C. According to Tonra, perhaps the best indicator of why some cities attract more pigeons comes down to density. The higher the human density, the higher the pigeon density. "In a place like Manhattan, the variety of places for them to nest is so much larger, and there's more trash to feed on," Tonra said. More people per square mile means more structures and infrastructure for pigeons to live in, as well as more food - whether bird seed or french fries - to peck at. Tonra said population density is probably not the only factor at play in Columbus, but it is significant. After learning so much about pigeons, it was time to head out and see if I could spot one in the “wild.” To join my quest, I enlisted the help of Bill Heck, a veteran birder who's on the board of directors for the National Audubon Society. Heck is also a past president of the Columbus Audubon Society. Our first stop was Waterman Farm, an Ohio State University Agriculture facility just a couple miles west of campus. Both Heck and Tonra observed a flock of pigeons in that area before. “A lot of us think of pigeons as city birds,” Heck said, adding that pigeons find homes on farms as well. “They eat agricultural waste products, typically grain that's been spilled. So there’s always some of that food supply and the pigeons hang out there." 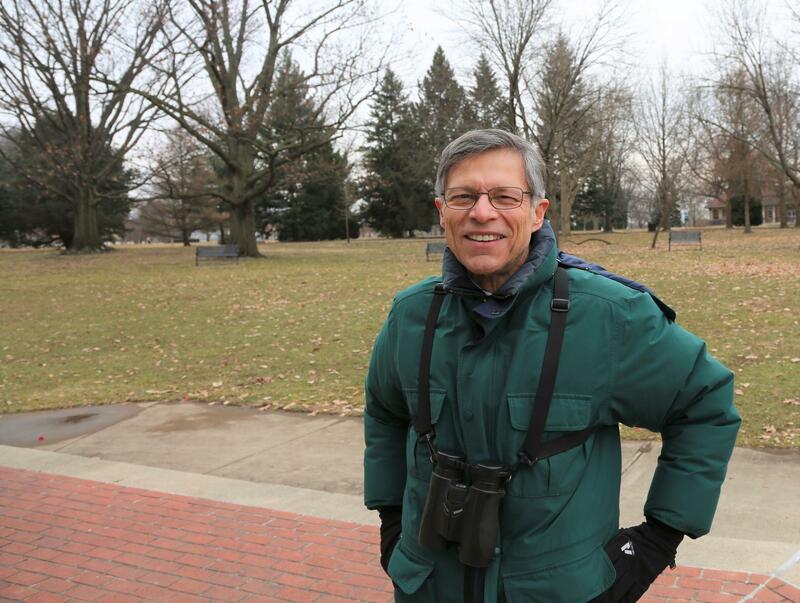 Bill Heck, birder and past president of the Columbus Audubon Society, looks for pigeons in Goodale Park. We knew that a flock of pigeons resided at the Ohio State farm, but couldn’t locate them. I was beginning to wonder if we really might not see any pigeons on our trip, or maybe if the recent Polar Vortex had killed off some flocks. We headed downtown, and minutes after we started driving south on Route 315, we spotted a couple dozen pigeons on light posts and wires along the roadway. Hoping to get a closer look, we parked in the Short North to explore city streets and Goodale Park. “Pigeons, unlike a lot of birds, don't like trees,” Heck told me. Parks can attract pigeons because of trash, and because people often go to parks to feed birds. We weren’t able to see any pigeons up close, but we did see several dozen birds on the powerlines beyond I-670. Before we ended our trip, Heck wanted to head back to Waterman Farm to see if we’d have better luck. Sure enough, we quickly spotted 40 or 50 pigeons perched on the wires along Lane Ave. 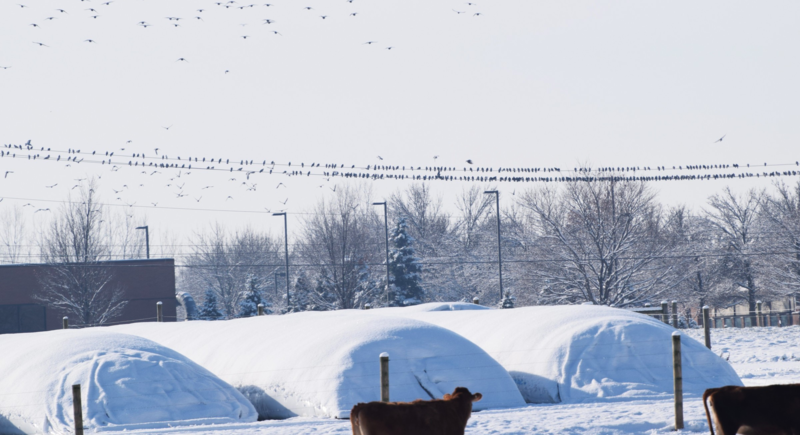 Dozens of pigeons perch on power lines along Lane Avenue near Ohio State's Waterman Farm. Pigeons are not the most exciting species for avid birders, but Heck said he enjoyed our excursion. “This has been an educational trip for me,” he said. Though pigeons don’t seem to be as common in Columbus as other cities, they are here if you know where to look. Do you have questions about the animals or nature around Columbus? Ask us below and we may investigate as part of our Curious Cbus series. Curious Cbus: What Happens To Zoo Animals When They Die? Grahm S. Jones / Columbus Zoo and Aquarium. At the end of last year, the Columbus Zoo faced the loss of three giraffes and an Asian elephant calf over the span of six weeks. The deaths were unconnected, and zoo officials say an external review committee found there was nothing they could have done to save the animals. A freight train chugs across a bridge high above as Cleveland Metroparks historian Karen Lakus begins a tour of what she calls the hidden valley. Not long ago, she says, this was a dump. “It was trash and gravel, and it was completely overgrown,” she says. Each spring, barnacle geese migrate more than 1,800 miles from the Netherlands and northern Germany to their breeding grounds in parts of Russia above the Arctic Circle. 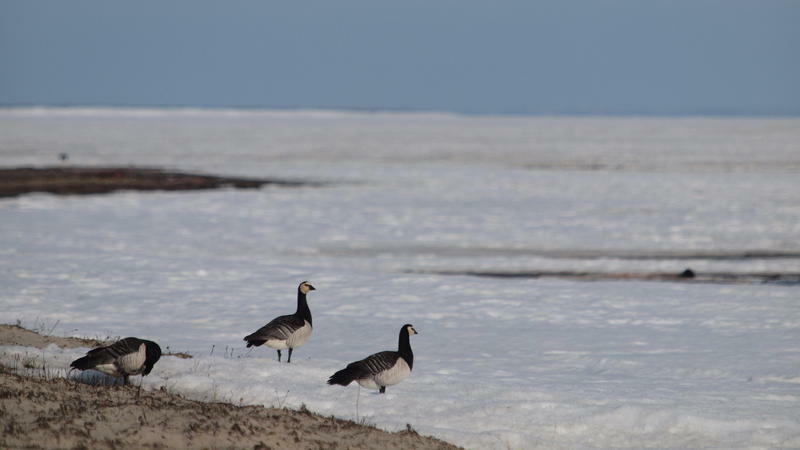 The journey north usually takes about a month, and the geese make multiple stops along the way to eat and fatten up before they lay their eggs, says Bart Nolet of the Netherlands Institute of Ecology and the University of Amsterdam. Rebecca Jaramillo insists that every bird has its own, distinct personality. She would know—she spends almost every day around them, while they’re at their most vulnerable. 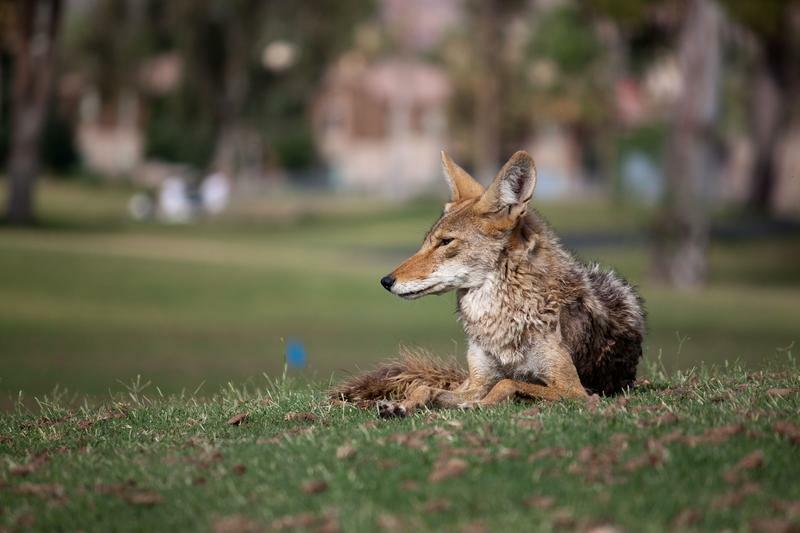 When coyotes start howling, their cacophonous calls may sound alarming to some people. However, the sporadic-sounding yelps are generally just canine chitchat.